St. Bega was a saint of the early Middle Ages. She was an Irish princess who valued virginity. She was promised in a marriage to a Viking Prince who was the son of the King of Norway. To avoid her arranged marriage, she fled across the Irish Sea and landed at St. Bees on the Cumbrian coast. She settled there for a while, leading a life of piety. She feared the oncoming raids of Pirates along the coast, and moved to Northumbria. The account of St. Bega’s flight from Ireland is found in the “Life of St. Bega”, which was part of a collection of various English saints lives that belonged to the Holmcultram Abbey and is dated to the mid thirteenth century. 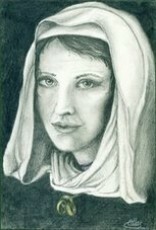 It tells that Bega lived in seclusion and after a time, moved to Northumbria where she was admitted to sacred vows. It also states she founded a convent at Hartlepool. St. Bega is associated with a number of miracles, the most famous being the “Snow Miracle”, which is described in the Life of St. Bega. “Ranulf le Meschin had endowed the monastery with its lands, but a lawsuit later developed about their extent. The monks feared a miscarriage of justice. The day appointed for a perambulation of the boundaries arrived – and lo and behold, there was a thick snowfall on all the surrounding lands but not a flake upon the lands of the priory”. A version of the Snow Miracle is also found in the Sanford manuscript, which was written in English after the dissolution, and formerly in the Dean and Chapter archives at Carlisle Cathedral. The book “Life of St. Bega” contains accounts on nine miracles brought about by the influence of St. Bega. They are earthy folk tales with a miraculous interpretation. The first concerns a raider from Galloway, who set out to steal a horse. His mother warned him against theft on the land of St. Bega, but her son was scornful and moving his hands to the private parts of his buttocks, he tauntingly had said to his mother, “What can the little old woman do to me”? As he escaped with his horse, arrows were fired after him as he crouched low on the horse, and the inevitable happened. Another tells the concerns of Godard of Millom, whose men would not remove their horses from the monk’s pasture to which they had strayed. When the men came to saddle the horses, they found the hooves almost severed, and in penance Godard gave the field to the Monks. In another story, three men of Workington, who were imprisoned in Egremont Castle of killing a man in a drunken brawl, but having confessed their sins to St. Bega, were rescued by her and found sanctuary at St. Bees. And finally, another miracle tells of two sick brothers who after seeing a vision at Tynmouth, traveled to St. Bees in a cart, and were healed, leaving the cart behind in thanksgiving. The official register of St. Bees Priory records several miracles by the power of prayer to St. Bega. In 1310, “God worked many miracles by the prayers and merits of St. Bega, to the edification of all the people with many eye-witnesses”. Three years later, “A certain Irish boy received his sight in the Chapel of St. Bega through the merits and prayers of St. Bega, witnessed by the entire community”. St. Bega was an Irish Princess that was promised in an arranged marriage, to the son of the King of Norway. She fled to avoid this, seeking the religious life. She fled, and lived in seclusion and in piety, before entering a convent. She performed many miracles, and they were recorded in both, a 13th – Century writing, “The Life of St. Bega”, and in the register at the Convent at St. Bees where she was located. She had a unique connection with God, and lived her faith, sharing it with those around her. God is there and wants us to be united with Him, just as St. Bega united with Him, and did His will. We too, can do miraculous things if we would only “unite” our will, to the will of God.